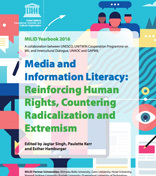 Media and Information Literacy: Reinforcing Human Rights, Countering Radicalization and Extremism - The increasingly complex media and information landscape, which has a primary role in our everyday lives, is rapidly changing. It is constantly altering how we communicate, enabling and challenging human rights, freedom of expression, universal access to information, peace building, sustainable development, and intercultural dialogue. Read/download the book here. 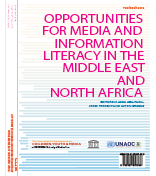 Opportunities for Media and Information Literacy in the Middle East and North Africa is the seventeenth Yearbook published by the Clearinghouse and fills a gap in the existing body of literature about the progress of media and information literacy work in different parts of the world. We believe it is of particular interest to shed light on a region, the MENA region, where young citizens’ engagement with media has been in focus in news reporting all over the world in recent years and awareness of MIL competencies is gaining ground. Read/download the book here. 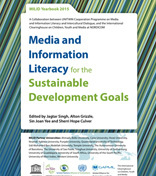 UNITWIN Cooperation Programme on Media and Information Literacy and Intercultural Dialogue (MILID) is based on an initiative from UNESCO and the UN Alliance of Civilizations. Together with International Clearinghouse on Children, Youth and Media at NORDICOM, University of Gothenburg, they have published the MILID Yearbook 2015. Read/download the book here. PLURAL+ is a youth video festival focusing on the themes of migration, diversity and social inclusion, organized by the United Nations Alliance of Civilizations (UNAOC) and the International Organization for Migration (IOM) with the support of many international partners. Recognizing youth as powerful agents of social change in a world too often characterized by intolerance and division, PLURAL + invites young people to express their views and creativity in short videos. Read/download the Discussion Guides here. 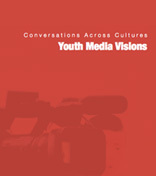 Youth Media Visions is intended to be a useful resource for people interested in exploring the intersection of youth media, education and creation. It presents seven experiences developed by educators and media creators, who within their organizations work with young people and media production. An initiative of Teachers College/Columbia University and the UNAOC. Read/download the book here.